Download "SUBCHAPTER 10F ELECTRONIC BILLING RULES SECTION.0100 ADMINISTRATION"
5 04 NCAC 10F.0105 ELECTRONIC MEDICAL BILLING, REIMBURSEMENT, AND DOCUMENTATION (a) Payers and payer agents shall: (1) accept electronic medical bills submitted in accordance with the standards adopted in this Subchapter; (2) transmit acknowledgments and remittance advice in compliance with the standards adopted in this Subchapter in response to electronically submitted medical bills; and (3) utilize methods to receive electronic documentation required for the adjudication of a bill. 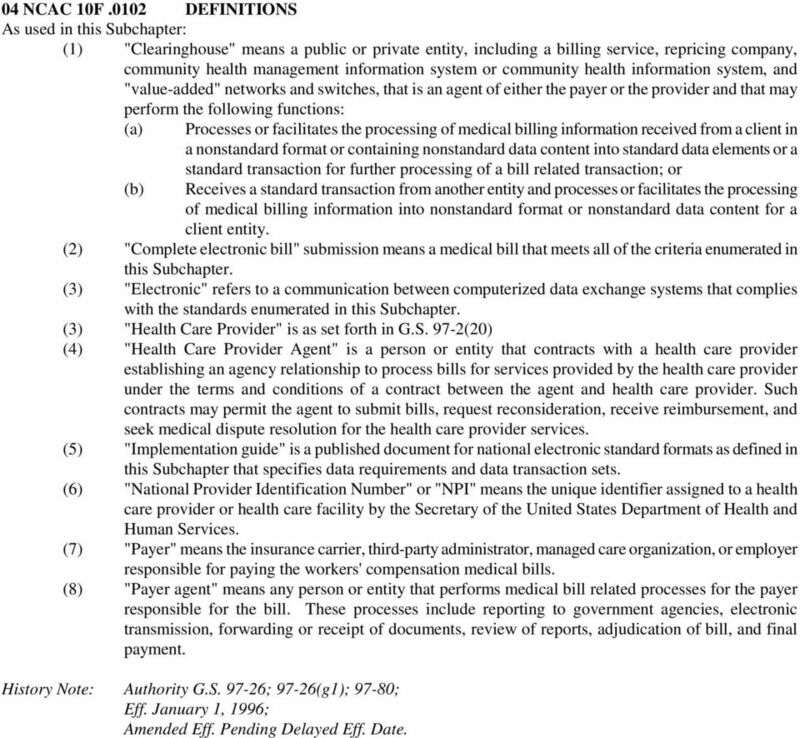 (b) A health care provider shall: (1) exchange medical bill data in accordance with the standards adopted in this Subchapter; (2) submit medical bills as defined by this Rule to any payers who have established connectivity with the health care provider system or clearinghouse; (3) submit required documentation in accordance with Paragraph (d) of this Rule; and (4) receive and act upon any acceptance or rejection acknowledgment from the payer. 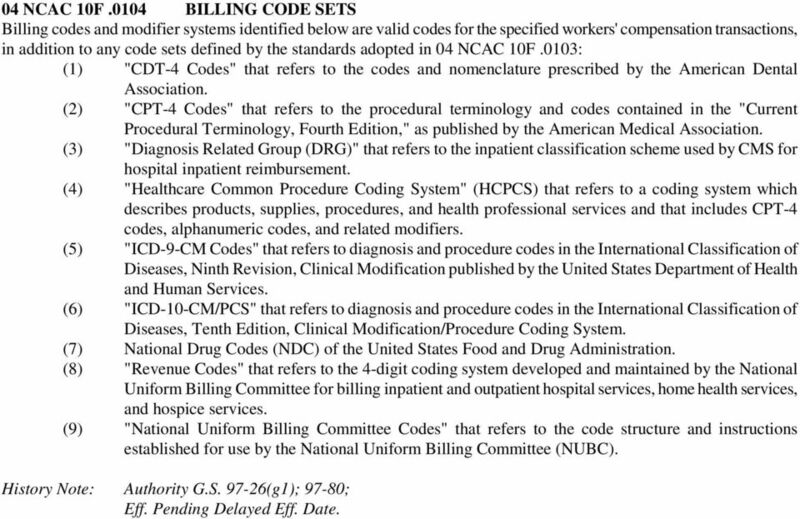 (c) To be considered a complete electronic medical bill, the bill or supporting transmissions shall: (1) be submitted in the correct billing format, with the correct billing code sets as presented in this Rule; (2) be transmitted in compliance with the format requirements described in this Rule; (3) include in legible text all medical reports and records, including evaluation reports, narrative reports, assessment reports, progress reports and notes, clinical notes, hospital records and diagnostic test results that are necessary for adjudication; (4) identify the: (A) injured employee; (B) employer; (C) insurance carrier, third party administrator, managed care organization or its agent; (D) health care provider; and (E) medical service or product; (5) comply with any other requirements as presented in a companion guide published by the Commission; and (6) use current and valid codes and values as defined in the applicable formats defined in this Subchapter. (d) Electronic Acknowledgment: (1) Interchange Acknowledgment (TA1) notifies the sender of the receipt of, and structural defects associated with, an incoming transaction. (2) As used in this Paragraph, Implementation Acknowledgment (ASC X12 999) transaction is an electronic notification to the sender of the file that it has been received and has been: (A) accepted as a complete and structurally correct file; or (B) rejected with a valid rejection code. 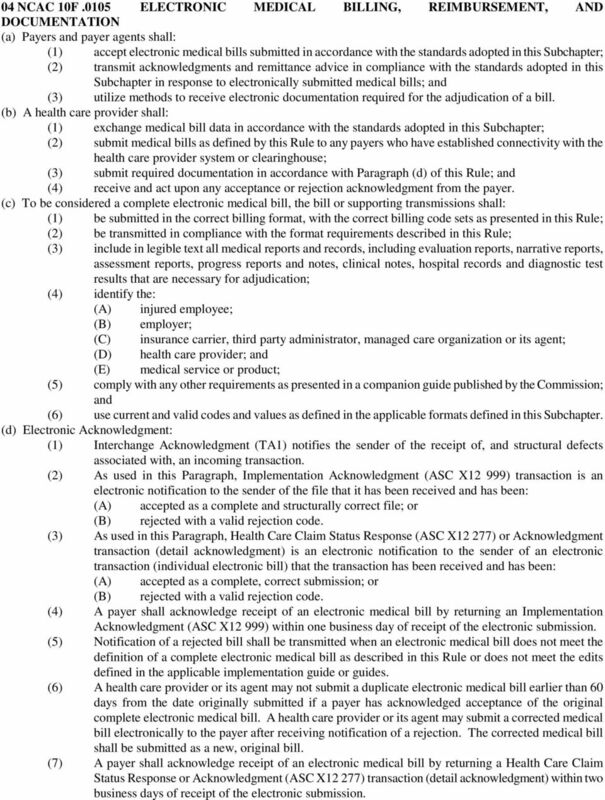 (3) As used in this Paragraph, Health Care Claim Status Response (ASC X12 277) or Acknowledgment transaction (detail acknowledgment) is an electronic notification to the sender of an electronic transaction (individual electronic bill) that the transaction has been received and has been: (A) accepted as a complete, correct submission; or (B) rejected with a valid rejection code. (4) A payer shall acknowledge receipt of an electronic medical bill by returning an Implementation Acknowledgment (ASC X12 999) within one business day of receipt of the electronic submission. 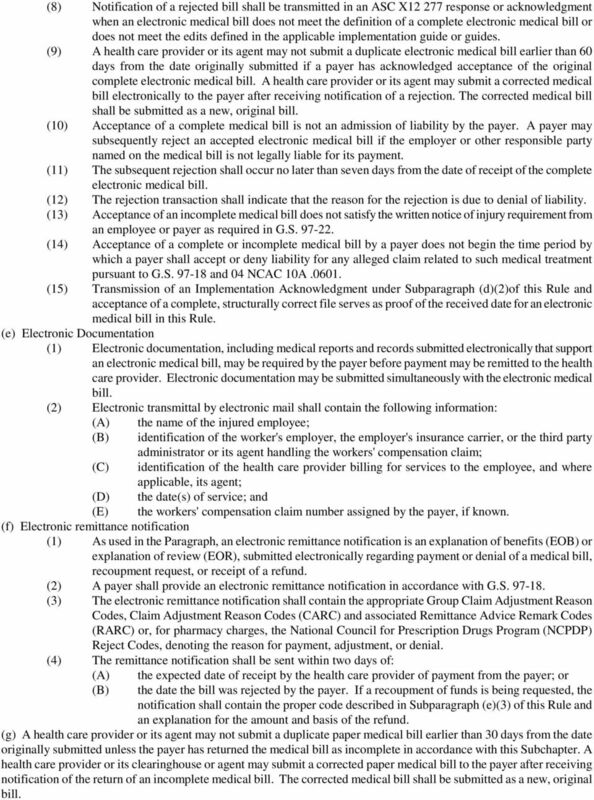 (5) Notification of a rejected bill shall be transmitted when an electronic medical bill does not meet the definition of a complete electronic medical bill as described in this Rule or does not meet the edits defined in the applicable implementation guide or guides. (6) A health care provider or its agent may not submit a duplicate electronic medical bill earlier than 60 days from the date originally submitted if a payer has acknowledged acceptance of the original complete electronic medical bill. A health care provider or its agent may submit a corrected medical bill electronically to the payer after receiving notification of a rejection. The corrected medical bill shall be submitted as a new, original bill. (7) A payer shall acknowledge receipt of an electronic medical bill by returning a Health Care Claim Status Response or Acknowledgment (ASC X12 277) transaction (detail acknowledgment) within two business days of receipt of the electronic submission. 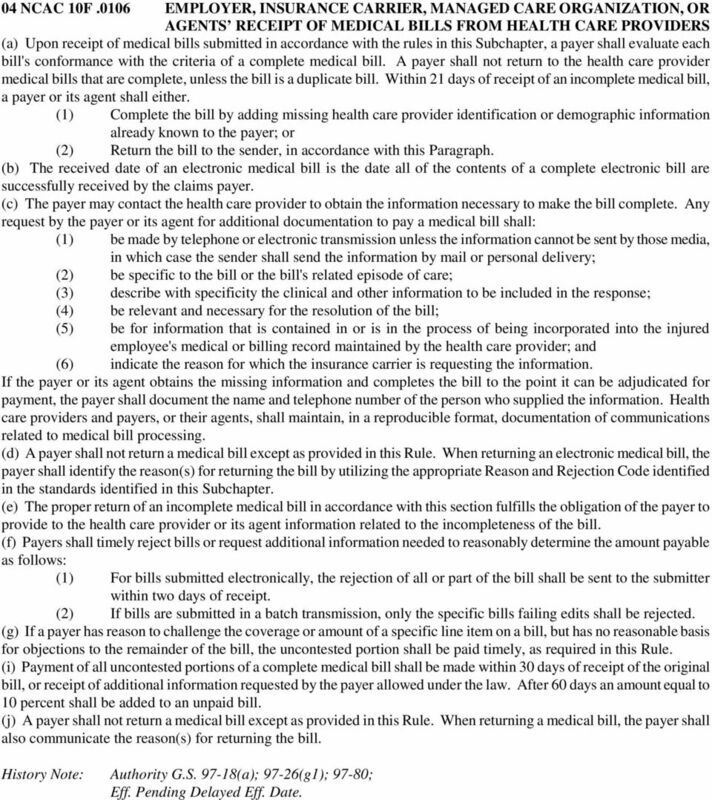 6 (8) Notification of a rejected bill shall be transmitted in an ASC X response or acknowledgment when an electronic medical bill does not meet the definition of a complete electronic medical bill or does not meet the edits defined in the applicable implementation guide or guides. (9) A health care provider or its agent may not submit a duplicate electronic medical bill earlier than 60 days from the date originally submitted if a payer has acknowledged acceptance of the original complete electronic medical bill. A health care provider or its agent may submit a corrected medical bill electronically to the payer after receiving notification of a rejection. The corrected medical bill shall be submitted as a new, original bill. (10) Acceptance of a complete medical bill is not an admission of liability by the payer. A payer may subsequently reject an accepted electronic medical bill if the employer or other responsible party named on the medical bill is not legally liable for its payment. (11) The subsequent rejection shall occur no later than seven days from the date of receipt of the complete electronic medical bill. (12) The rejection transaction shall indicate that the reason for the rejection is due to denial of liability. (13) Acceptance of an incomplete medical bill does not satisfy the written notice of injury requirement from an employee or payer as required in G.S (14) Acceptance of a complete or incomplete medical bill by a payer does not begin the time period by which a payer shall accept or deny liability for any alleged claim related to such medical treatment pursuant to G.S and 04 NCAC 10A (15) Transmission of an Implementation Acknowledgment under Subparagraph (d)(2)of this Rule and acceptance of a complete, structurally correct file serves as proof of the received date for an electronic medical bill in this Rule. (e) Electronic Documentation (1) Electronic documentation, including medical reports and records submitted electronically that support an electronic medical bill, may be required by the payer before payment may be remitted to the health care provider. Electronic documentation may be submitted simultaneously with the electronic medical bill. (2) Electronic transmittal by electronic mail shall contain the following information: (A) the name of the injured employee; (B) identification of the worker's employer, the employer's insurance carrier, or the third party administrator or its agent handling the workers' compensation claim; (C) identification of the health care provider billing for services to the employee, and where applicable, its agent; (D) the date(s) of service; and (E) the workers' compensation claim number assigned by the payer, if known. (f) Electronic remittance notification (1) As used in the Paragraph, an electronic remittance notification is an explanation of benefits (EOB) or explanation of review (EOR), submitted electronically regarding payment or denial of a medical bill, recoupment request, or receipt of a refund. (2) A payer shall provide an electronic remittance notification in accordance with G.S (3) The electronic remittance notification shall contain the appropriate Group Claim Adjustment Reason Codes, Claim Adjustment Reason Codes (CARC) and associated Remittance Advice Remark Codes (RARC) or, for pharmacy charges, the National Council for Prescription Drugs Program (NCPDP) Reject Codes, denoting the reason for payment, adjustment, or denial. (4) The remittance notification shall be sent within two days of: (A) (B) the expected date of receipt by the health care provider of payment from the payer; or the date the bill was rejected by the payer. If a recoupment of funds is being requested, the notification shall contain the proper code described in Subparagraph (e)(3) of this Rule and an explanation for the amount and basis of the refund. (g) A health care provider or its agent may not submit a duplicate paper medical bill earlier than 30 days from the date originally submitted unless the payer has returned the medical bill as incomplete in accordance with this Subchapter. A health care provider or its clearinghouse or agent may submit a corrected paper medical bill to the payer after receiving notification of the return of an incomplete medical bill. The corrected medical bill shall be submitted as a new, original bill. Harbor s Payment to Providers Policy and Procedures is available on the Harbor website and will be updated annually or as changes are necessary. on the status of a claim previously submitted to CMS for processing. A code that identifies the category a claim falls within. Claims Procedures. H.2 At a Glance. H.4 Submission Guidelines. H.9 Claims Documentation. H.17 Codes and Modifiers. H.
H.2 At a Glance H.4 Submission Guidelines H.9 Claims Documentation H.17 Codes and Modifiers H.22 Reimbursement H.25 Denials and Appeals At a Glance pledges to provide accurate and efficient claims processing.